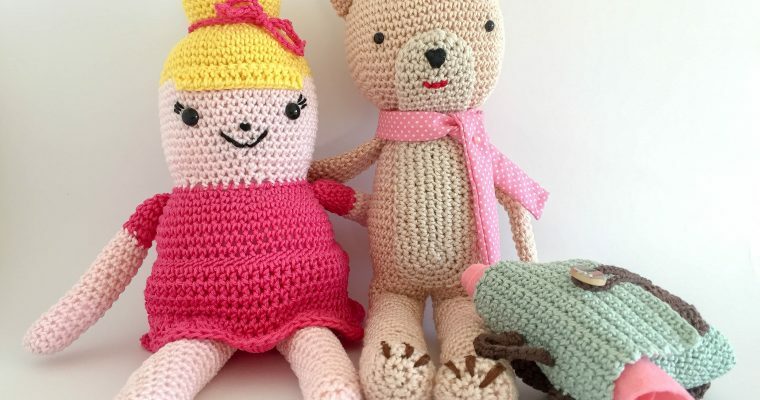 While you can still enter the “Designer Amigurumi”-giveaway (simply go here, and leave your comment), I’m delighted to tell you that today’s post comes with a marvelous giveaway as well! 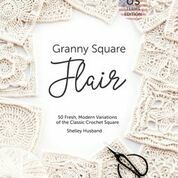 My truly super-talented and longtime crochet friend Shelley / @spincushions has just published a new book – “Granny Square Flair”, and she has graciously allowed me to give away a copy of that fan-tas-tic book. 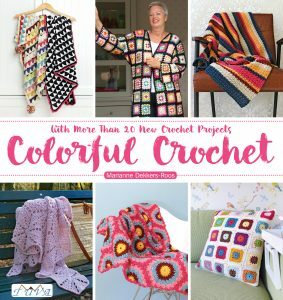 Believe you me: this is another must-have book for all of us granny square and crochet lovers. I’ve been a huge fan of Shelley’s work ever since I found her on Instagram, more than 5 years ago. 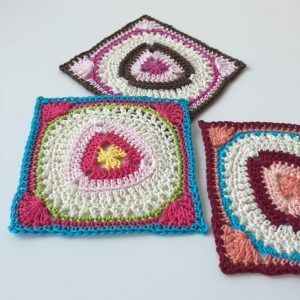 At that point she was slowly but surely changing her focus from one craft (making the most beautiful and cute pincushions, as you can see one enchanting example of here) to another, crochet, and it is safe to say that the crochet world in general has benefited from that. The book that has just come out is not Shelley’s first book, but it is her first ‘printed on paper’-book that, by the way, is also available as an e-book (as are all her previously published books, all 8! of them, as listed here). I’ve had the honor to review some of Shelley’s earlier books, and as I was reading through those posts (here, here, and here), I found myself commenting on my own statements, going “yes”, “exactly”, “so true”! All comments, observation and praise given there are germane for this new book, and that alone is a pretty impressive accomplishment. You see, “Granny Square Flair” has not only 50 (!) 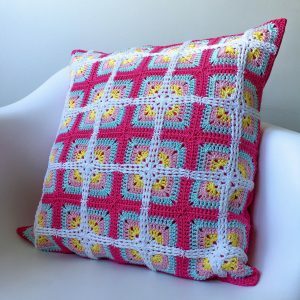 fantastic granny square designs, it also has an extensive and wonderful section of “crochet techniques”, the bonus of which are Shelley’s very own clever crochet tips to make your crochet even look better. * there is a US-terms edition, as well as a UK-terms version (both for sale here, and here). 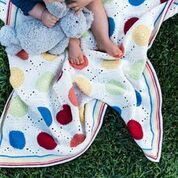 So far, I’ve crocheted 2 patterns from this book, and used different colors for both of them. I think you know I love geometric crochet, so I had to try “Quion” (I mean: a triangle, a circle and a square all in one design, what’s not to love? )… and I like how these 3 came out. 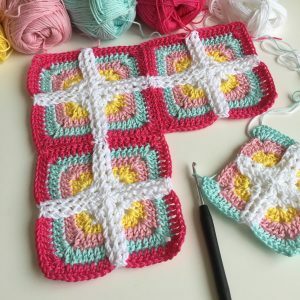 When I had a closer look at granny square “Killarney”, I thought “mmm… wouldn’t it be cool, if I could crochet all front-post-stitches in the same color, thus creating a kind of elevated trellis on the granny squares. This meant I had to carry the fp-stitches-yarn in all rounds, which was a bit fiddly at first; seeing how well it worked out though, made up for the fiddlyness :-)! I am so, SO happy with how this cushion turned out! 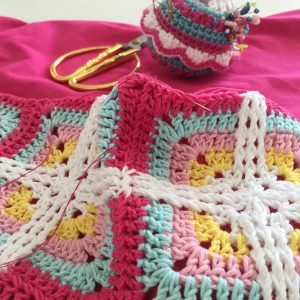 blocking makes a big difference – I’m a fan! 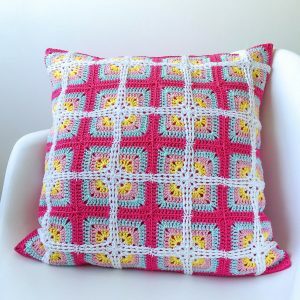 Even though it’s kind of hard to part with a project I really liked working on, and love how it looks now that it is finished, I’ve already put the “Killarney Cushion” up for sale in my webshop. I hope it will find a lovely new home to live in. By the way: more “maRRose”-projects will be put up for sale soon; there are way too many finished projects in my – spacious – studio … Marie Kondo here I come ;-)! 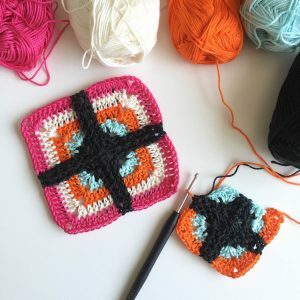 Soooo… how to enter the “Granny Square Flair”-giveaway? Please leave a comment under this post, telling me whether you prefer a hard copy of Shelley’s book, or the pdf-version; the giveaway is open to all (yay! ), and will close Sunday August 19, 2018 – 22:00 (CET). Make sure I can reach you via email – if I do not hear back from the winner within 24 hrs after notification, a new winner will be drawn. Wishing you all good luck, and a super happy Weekend! Weer zo’n prachtig boek! En hoe jij je eigen kleurgebruik loslaat op de.patronen: heel erg mooi!. Ooit hoop ik nog een granny deken te haken met al mijn restanten katoen. Dit boek is vast een goede inspiratiebron daarvoor?. Graag doe ik mee met deze give-away. (Ik word een beetje hebberig van al die toffe weggevers?) Mocht ik winnen dan graag de papieren versie van het boek. Bladeren, dromen en doen=heerlijk! 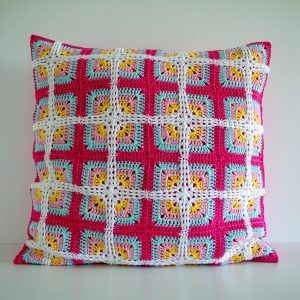 Thanks for the lovely review of Granny Square Flair – I recently found SpinCushions on Instagram myself and have been in LOVE with all of her work. 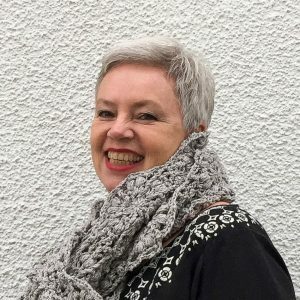 Being fairly new to the world of crochet (<1 year), I am always looking for opportunities to learn and grow from more experienced crocheters. It would be amazing if I could get my hands on a copy of her book (ebook or hard copy! ), as I think I could really benefit from it. 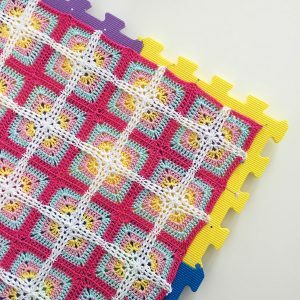 I’m going to (secretly) make my grandmother a granny square blanket once I polish up my skills, and it would be great to have some new inspiration. If I get chosen as the winner of this giveaway, I would be so happy! I always prefer hard back books, but for the sake of saving on shipping costs, I would never complain about an ebook. Thanks!! O Marianne, lijkt mij echt een fantastisch boek! Jij beschrijft het met zoveel enthousiasme, dat werkt aanstekelijk! Jouw kussen is echt heel mooi geworden, petje af hoor! Ik ben ook bezig met onspullen, heerlijk! Het boek van Marie Kondo heeft mij ook geïnspireerd, als je er niet blij van wordt, verkoop het dan of breng het naar de kringloop (in mijn geval). Succes! Looks like a beautiful book – would love to have a hard copy. Thanks for all of your inspiration. 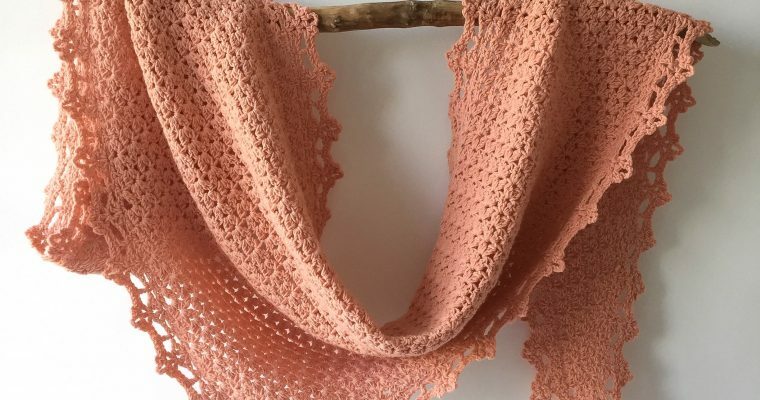 Sometime in the next 5 years I hope to be able to retire and then I will try all of the wonderful crochet patterns that I have seen over the years! 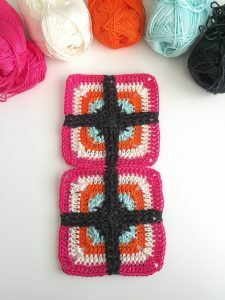 I’d LOVE to have “Granny Square Flair”. I’m a big fan of Shelley’s and have a lot of her patterns!! I’d like to have the hard copy of her book, but if it’s important, I could easily manage with the PDF version! Alweer zo een ongelooflijk goeie review…. 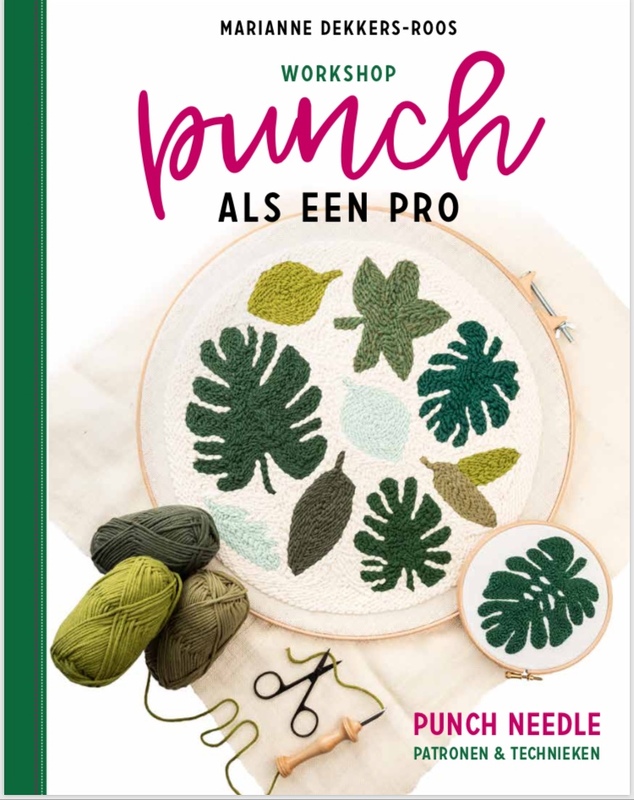 Alleen al de cover van het boek is prachtig maar ik ben zo bang voor stokjes! Op de één of andere manier ziet het er bij andere altijd mooier uit. 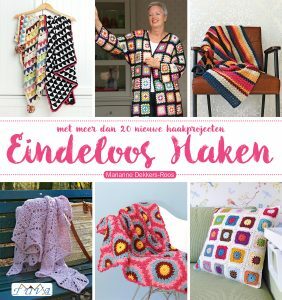 Maar een granny square deken staat nog altijd hoog op de wishlist. Super leuk om te lezen en de voortgang van sommige patronen (voornamelijk via Facebook) te volgen. Het ziet er allemaal zo vrolijk uit. Groetjes Diana. P.s. de hardcopy zou super staan tussen de andere handwerkboeken hier^^. This book looks like a winner! 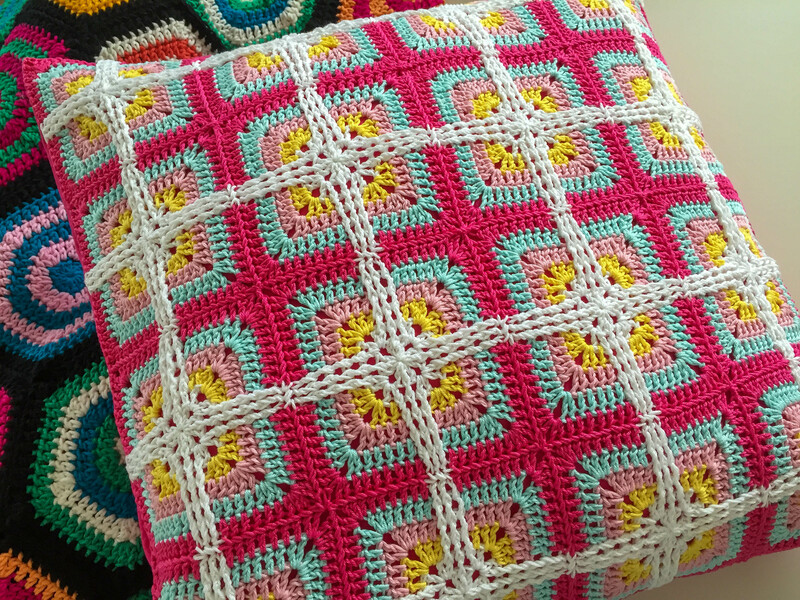 I love granny squares and this book seems to be full of useful squares! I would love to have a hard copy but would be just as happy with a pdf. Thank you for the chance to win this new book. This book looks like a winner! 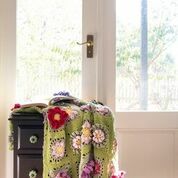 I love granny squares and this book has new ones to try. Thank you for the chance to win this new book. I would like a hard copy. Wow! Another stunning book! I’d love a hard copy to add to my little, but growing, collection. I love to look at my crochet related books in my craft corner. They motivate me to work. ? 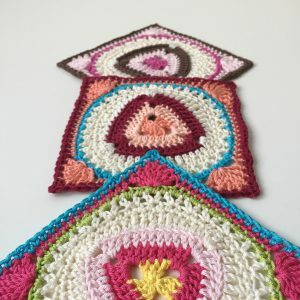 I love Shelley’s patterns and would love to have a hard copy of her book in UK terms, your review of the book and your cushion were great. Het resultaat van je kussen is prachtig. Hogere haakkunst. Ik doe graag mee aan de give-away, als ‘biebjuf’ ga ik graag voor het échte boek! I’m a huge fan of Shelley’s work and I would love a copy of the book preferably in hard copy but does it really matter in which format?? We know it’ll be fabulous either way! Wat leuk dat je zo enthousiast bent over dit boek. Je maakt me wel nieuwsgierig naar wat er nog meer in staat. Ik doe daarom graag mee aan de verloting: een pdf is prima.